John Roland Reuel Tolkien wrote one of the most famous openings in literature when he penned this line: "In a hole in the ground there lived a hobbit. . . " And those few words launched one of the most amazing careers in literary history. J.R.R. Tolkien, called "Tollers" or "JRRT" by close friends, and "Ronald" by his family, has been called the greatest writer of the 20th century. That assessment can be argued, perhaps, but the fact is that his books "The Hobbit" and "Lord of the Rings" became instant bestsellers read by millions, were turned into movies, and were responsible for wide - spread influence on other writers, such as J. K. Rowling and Kurt Vonnegut. His books even created an entire industry for churchwarden - style pipes once his movies hit the big screen. The cinematic scenes of hobbits smoking the long curvaceous pipes kick - started a fad about as big as the cigar boom of a few years back. Tolkien was born in South Africa Jan. 3, 1892. His father, Arthur Tolkien, and mother, Mabel Suffield Tolkien, had immigrated to Bloemfontein, South Africa, for Arthur’s job in banking. But by the time Tolkien was 12 - years - old, he was an orphan. His father died in 1896 when he was four years old, and then eight years later, his mother died. Being orphaned was a devastating blow to the sensitive boy who could read by the time he was four. His mother was a teacher who had her son reading Latin and French by the time he was 12, and when she died in 1904 from complications of diabetes, the foundations of his life were yanked from beneath him. Mabel Tolkien had been the greatest influence in her son’s life. She had introduced him to the world of books and instilled in him a lifelong love of words. That literary upbringing was to influence Tolkien for the rest of his life, and eventually determine his very future. Her death worsened an already terrible economic condition for the family, especially since the loss of Arthur Tolkien, the family’s single source of income. After the death of his father, Tolkien, his brother, Hilary, and his mother had almost been destitute. And after the death of Mabel, Tolkien was sent to live with relatives and then to Father Francis Morgan, a Catholic priest in a small village near Birmingham. The priest became his legal guardian, benefactor, confessor and father figure. In fact, Father Francis, a pipe smoker, was a big influence on the young Tolkien, who later attributed his "addiction to the pipe" to the priest. Although Father Francis was a generous man, he was exceptionally stern with Tolkien and his brother. Once, when he discovered that Tolkien and Edith Bratt, another orphan - and unwanted illegitimate child - were fond of one another, he moved to separate them, a scheme that failed. Edith was three years older than Tolkien, but that didn’t stop the two lovers, who, from their teen years until Edith died in 1971, remained partners in life and love. Tolkien was devoted to Edith Bratt. With the death of his parents, Tolkien turned to solace in books and words. At a young age, he was already proficient in Latin, German and French, and then he discovered Old English. His early introduction to languages continued as he matured and eventually was accepted to Oxford University, where he became a philologist. Along the way, Tolkien also became fascinated by the role of myths in life. He read Old Icelandic and Norse stories, became enthralled with the language, especially Old English and Welsh. He even invented his own alphabet of a language he was to use in the two of the books that are among the most famous stories in the English language. Like his close friend, C.S. Lewis, Tolkien found himself on the front lines in 1915 when he finished his Oxford studies in English Literature. It was the beginning of World War I which would become the killing ground for an entire generation of English, German and French youth. Similar to Lewis, he became an officer and soon was marching with the Lancashire Fusiliers on the front lines in Somme. As a lieutenant on the Somme, he was thrust into trench warfare where he witnessed some of the worst action of World War I. Like Lewis, Tolkien lost many Oxford companions in the war, leaving an indelible mark on his psyche for the remainder of his life. Although he was never seriously wounded, as Lewis was, he did contract trench fever, a common trench disease, usually from body lice. In fact, it is estimated that 97 percent of the British officers and men who fought on the Western Front in the Great War were infected with the fever, sometimes called "five-day" fever since it lessened after five days and then reoccurred some five days later. After the war, Tolkien attempted to resume his Oxford career, but could find work only on the staff of the Oxford English Dictionary and tutoring students on the side. In 1920, he got a post as a "Reader" in English at Leeds University. This was his first real job in a university and four years later, he earned a full professorship. Then, in 1925, he was appointed a Professor of Anglo-Saxon at Oxford, where he and C.S. Lewis became dons about the same time. In the early 1930s, Tolkien had been tinkering with the idea of developing a mythology for his native England. He had already created a new language, which his wife, Edith, and he used during the war to let her know precisely his whereabouts and what he was doing. Thus, was Middle Earth born. It was the land of the hobbit and of other small creatures such as elves and dwarves. He invented an elaborate mythical world, and even gave the hobbits pipes to smoke. In fact, he claimed that they had discovered "pipe weed." 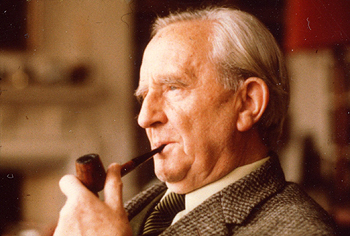 Not a great deal is known about Tolkien’s pipe smoking, even though he was seen regularly with a pipe. Some accounts have speculated that he smoked a kind of Navy flake, since some of those old tins were evident in his homes. Once emptied of tobacco, they were used to hold bric-a-brac around the house. Tolkien’s son, Christopher, also smoked a Navy flake, which may have been the result of his father’s influence. Tolkien’s pipes seem to run along the order of small English billiards, which would have been common in his time. And there is this evidence: During World War I, Alfred Dunhill, the canny English businessman, who had built up a sizeable business with a leather and harness firm, transitioned into the new fangled motor cars, which brought him into the pipe-making arena with his pipe that was strictly designed for the motor car. 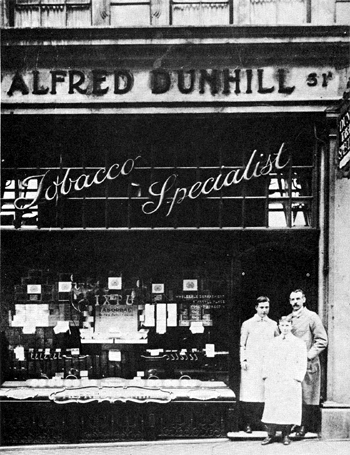 The Dunhill blending legend began in the early 1900s, and by the time World War I rolled into history, Alfred Dunhill was blending some of the finest tobaccos anywhere. He provided low-cost "campaign" pipes and "campaign" tobacco to soldiers who were headed for the front lines. And in 1915, Dunhill developed its famous White Dot, which was designed to help the smoker line up the stem with the shank. Although it is uncertain where or when Tolkien picked up his first pipe and pipe tobacco, it is likely that heading for the stresses of war and leaving behind his wife of only a few weeks, he picked up a Dunhill pipe for comfort. It is known that C.S. Lewis smoked a "campaign" pipe, so it is also very likely that Tolkien did as well. Regardless, once home from the war, Tolkien was rarely seen without a pipe, either between his teeth or in his hand. It was then that he became most prolific in creating and inventing characters from antiquity, which he believed came not only from his imagination, but possibly might have existed in some ancient realm. In fact, he once compared himself to the hobbits. Humphrey Carpenter’s incomparable "J.R.R. Tolkien: a biography," quotes the author on the similarities "between the creator and the creation." "’I am in fact a hobbit,’" Carpenter quotes from Tolkien, "’in all but size. I like gardens, trees, and unmechanized farmlands; I smoke a pipe, and like good plain food, but detest French cooking. I like, and even dare to wear in these dull days, ornamental waistcoats. I am fond of mushrooms; have a very simple sense of humor; I go to bed late and get up late. I do not travel much.’"
And, as a "hobbit," Tolkien loved his pipe weed. Some of the weed that the hobbits enjoyed in their pipes, which was completely made up from the mind of Tolkien, was "Old Toby," a "Southfarthing pipe weed," named after the character Tobold Hornblower. Other pipe weed names included "Longbottom Leaf," and "Southern Star." Pipe weed in Tolkien’s world was an herb, sweet scented and fragrant, and was grown, produced and sold by hobbits. In fact, the hobbit wizard, Gandalf, who learned to smoke pipe weed from the hobbits, once had this remarkable quote about the "art": "You might find that smoke blown out cleared your mind of shadows within. Anyway, it gives patience, to listen to error without anger" ("Unfinished Tales" by J.R.R. Tolkien and Christopher Tolkien, 1980). Fred Brown is a Retired Senior writer for the Knoxville News Sentinel and was a working journalist for 46 years before retiring in 2008. He lives in Knoxville, TN., where he continues to freelance. Tags: Famous Pipe Smokers, historical pipe smokers, J.R.R. 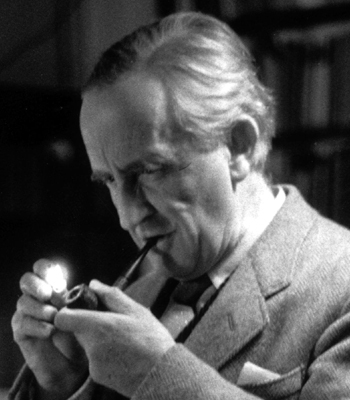 Tolkien pipe smoking, Lord of the Rings Pipe Smoking, Was J.R.R. 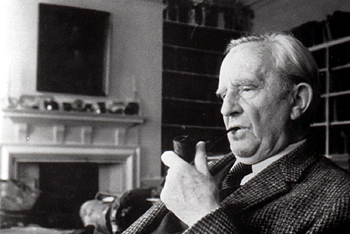 Tolkien a pipe smoker? Enjoyable read,nice job Mr Brown! Great read. I have the extended editions of the Lord of the Rings movies, and they all contain a pretty detailed account of Tolkiens life, but they never really touch on the fact that he liked to smoke a pipe, as this article did very well. Very fascinating and thoroughly enjoyable. Thank you! a good article thanks for posting it. Another great article about another great writer. Good stuff! That final quote is a great one! Enjoyed the article! Really a nice read. I didn’t realize the books were instant best sellers. I thought their popularity grew from their being a cult favorite amongst college students. Great read. Very enjoyable article. I’ll re-read it several times I’m sure. Great read, I love Tolkien! I believe I have seen comments elsewhere that Tolkien smoked Condor. Thanks for a great read. I’ve read elsewhere he favored Capstan Blue, along with his buddy C.S. It’s sobering to reflect on how the bounty of Tolkien’s pen may have been curtailed by tragic personal losses and the war that interrupted his life, yet these distractions may have been crucial in shaping the development and expansion of his genius. Thanks for another in what I hope is a long series of informative biographical sketches of noteworthy pipesters. Well written words Fred, I enjoyed the story, is it true The Hobbit was written as a bedtime story for his kids? This is something I read long ago, I always wondered if it was fact! Thanks for a great article. As fall is here in Oklahoma sitting with the book “hobbit” and a good pipe are two great pleasure of the day. Thank you, Fred Brown for sharing this article. I love the historical background information you shared. I appreciated it very much. My father was killed ten days before I was born. I’ve never smoked. Picked up a pipe only when a greay beard Grandfather, but recently discovered a photo of my father with a pipe in his hand. That was an emotional rush! I love to write and read and am often found, book in hand, and pipe in mouth. While not a Hobbit, it is now my habit! Very nice article! Thank you. I do rather suspect that many of us “Brothers of the Briar” would be described by our families and friends as Hobbit like, certainly my family has come to that conclusion and it is one I am content with. Great article, thanks. As a Tolkein lover myself, and a pipe smoker whose interest in that venerable “art” was encouraged in no small way by Tolkein’s entrancing descriptions of the weed, I find my interest in both Tolkein and pipes fired again by this engaging, informative, and fascinating article. Thank you Mr. Brown! I will definitely have to pick up a copy of Humphrey Carpenter’s biography for my winter break.